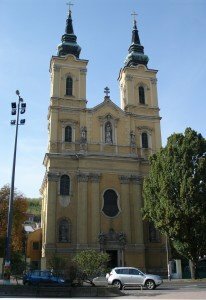 Our church, Mindszenti church (Saint Peter and Paul apostle church) is a roman catholic church at Mindszent tér (square), in the inner city of Miskolc. The construction of the church began in 1724, originally in baroque style. Its shape as known today was finalized in 1880. The location – Mindszent tér – surrounded by the International Trade Center in Miskolc (ITC), the Regional Health Insurance Headquarters was the main square of a medieval settlement called Mindszent. Those times you could find the chapel of the village in the place of the currently known Mindszent church. This is the only place in Miskolc where the church always belonged to the Catholic Church and never to any of the protestant churches. For a while this was the only catholic church in the city. The chapel (the ancestor of the current church) was first referred in 1507. Next to the chapel stood the poors’ hospital. In 1562 Fánchy Borbála, the chatelaine of the Diósgyőr Castle had it renovated. At the beginning of the 18th century abbot Althan Mihály Frigyes had the chapel demolished – which was renovated not long before. Then began the construction works of the new church. Some historians say that Giovanni Battista Carlone, the same person that designed Minorita Church in Miskolc, designed the new church. The new church that was not even fully complete, but it was sanctified in 1748. The frontispiece, sculptures, 5 altars and the pulpit were already complete but the internal works were not. The first shelter-hospital (hospitale pietatis) was started to build next to the church in 1761. The parish building was constructed in 1778. In the second half of the century there was a debate about the ownership between the primacy in Eger and the bishopric in Munkács. Mária Terézia (Maria Theresa) decided to give the control on the church to the lordship of Diósgyőr. In 1857 Ferenc József (Franz Joseph) visited the city and offered his financial help to cover one of the towers’ costs. The primacy of Eger also contributed with a bigger amount. Based on these funds and the donations of the followers the building of the eclectic style towers were started, the first tower was in place by the end of that year and not long after the second one as well. The towers are as high as 62 meter. So the church gained its current shape. Lateral walls are 20 meter high, the length of the church is 36 meter, and width is 15 meter. The crypt is still available for funerals. The main altar, the four side-altars, the font is the work of Johann Michael – sculptor from Eger. The main altar was sanctified on 21st November 1748. The meaning of the Hebrew text above is: God [Who exists]. The painting of the main altar was created by Kovács Mihály (painter from Eger) in 1855 showing Saint Peter and Paul apostles. He also painted the other altar pictures in the church in 1879 (Unspotted Virgin, Szent László (king) on the South side; Saint Joseph, Saint Stephen (king) on the North side.) The frescos were painted by Takács István (artist from Mezőkövesd) in 1951. The Stations of the Cross were created after World War II by Meilinger Dezső (painter from Miskolc). The organ is the work of Angster József (organ builder from Pécs), built in 1903. In front of the church stands the baroque style Csupros Maria statue (1738). In the neighborhood of the church you can find the Calvary stations and chapel sanctified by Bartakovtics Béla, the archbishop of Eger.